Much better than yesterday's run! Even though when we finished I definitely had to blow my nose, but overall I am feeling a lot better. We just ran near the house and throughout the entire run I was focusing on keep my feet light and running more naturally. I wear Nike Free Run 2 and have been working on striking my forefoot rather than striking my heel. I think that I am finally recovering from some ankle and foot pain, luckily the pain only happens when I am walking not running! Last night Mike and I were talking about what we were going to do after our half marathon on October 23 (only 24 days away!) and we had decided that we would continue to do a similar training plan as what we are doing now. The entire time that we have been running we have followed a plan and I think that both of us don't want to just run. I need structure in my life and I think having a plan has been beneficial to us, even if we don't have a race to train for. It's hard to see, I know, but do you notice something? Speed work. Mike and I haven't done any speed or track work yet because as beginners we thought it would be more beneficial to just focus on building up our stamina and mileage. Since we are progressing really well, we figured that after our half marathon we should probably work on speed. I really want to get faster. I'm pleased with our progress and Mike is pretty speedy, but I know that I can do better. 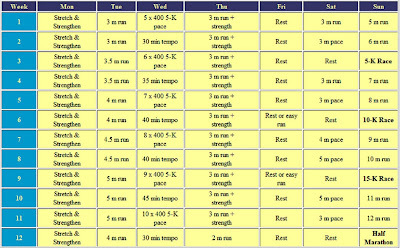 I want to be one of those runners who can consistently bust out an 8:30 pace in longer races and training runs. I know that I can do it but I think I still get scared that I am going to crash and burn if I try to push it just a little bit. Hopefully doing little bursts of speed will help me get used to going at a faster pace. I'm excited to give it a try! 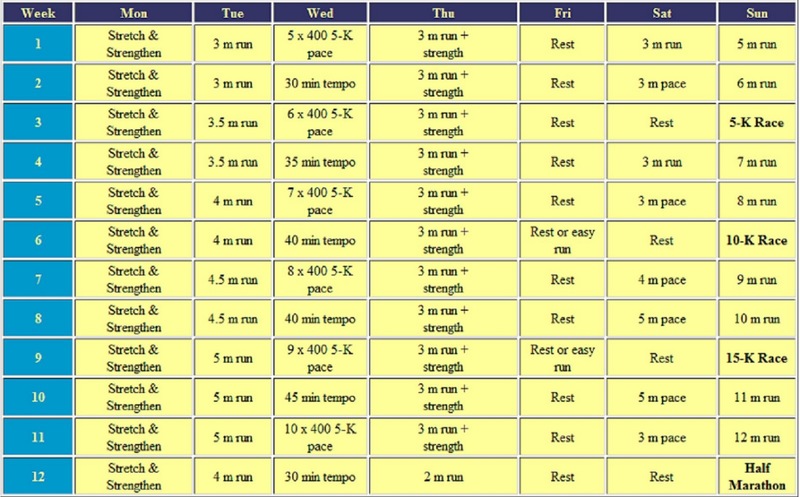 Do you always have to follow a training plan or can you just go out and run?